KAILUA-KONA – As work continues on the Queen Kaahumanu Highway Widening, Phase 2 project, access to the Hawaii Ocean Science and Technology (HOST) Park from the north bound Queen Kaahumanu Highway will available via the new fourth leg of the Kaiminani Drive intersection thanks to the opening of the Natural Energy Laboratory of Hawaii Authority (NELHA) Frontage Road on Tuesday, Sept. 5, 2017, and the addition of a left turn signal at the Kaiminani Drive intersection. Left turns onto Makako Bay Drive from the northbound Queen Kaahumanu Highway and the left turn movement from Makako Bay Drive onto northbound Queen Kaahumanu Highway were prohibited following the traffic shift on Aug. 23, 2017, and will be restricted for the foreseeable future. 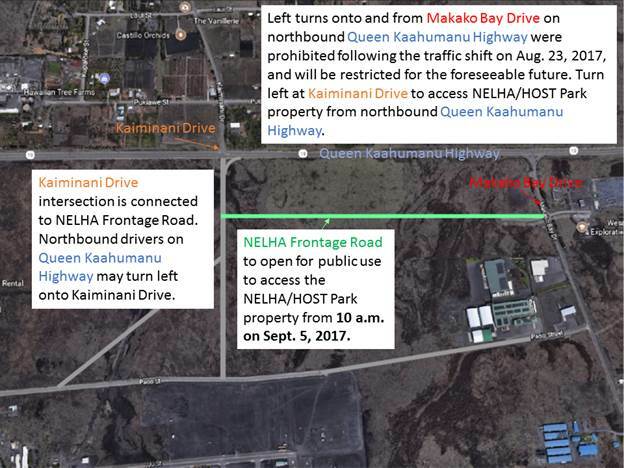 As a reminder, the existing Mauka portion of the Queen Kaahumanu Highway between Keahole Airport Road and Hulikoa Drive was closed following the traffic shift and all two-way traffic (vehicular, pedestrian, bicycle) between Hina Lani Street and a point north of Keahole Airport Road is now routed to the new Makai portion of the Queen Kaahumanu Highway. The Hawaii Department of Transportation (HDOT) thanks the public for their patience as we continue the work on the Queen Kaahumanu Highway Widening, Phase 2.